Fortunately being a man of incredible forethought I placed a few tasty things in my bag before I left. In amongst a couple of beers (deemed too warm for effective consumption) there were a couple of whiskies that I got from recent Whisky Tasting Club packs, both from Sullivans Cove. Sullivans Cove is made in Hobart, Tasmania, and is therefore pretty much as far away from the UK as you can get. Sullivans Cove is the area where initial settlement of Hobart began and thus the most likely place for any early distillation in the area. This distillery started up in 1994, one of the first on Tasmania since distilling was banned in 1838, and has grown over the years in both size and stature in the whisky world. They picked up a bunch of awards this year, including the World Whisky Awards Best Australian Single Malt 2013, a variety of medals from the World Whisky Masters and a similar haul from the inaugural Wizards of Whisky along with Australasian Distiller of the Year. 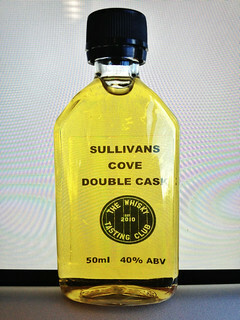 The latter competition is run by Dom Roskrow, one of the folks behind the Whisky Tasting Club, and it was in a Wizards tasting pack that I found my first dram – Sullivans Cove Double Cask. This is differently composed to their other whiskies, which are usually single casks, instead combining whisky fully matured in American and French oak. 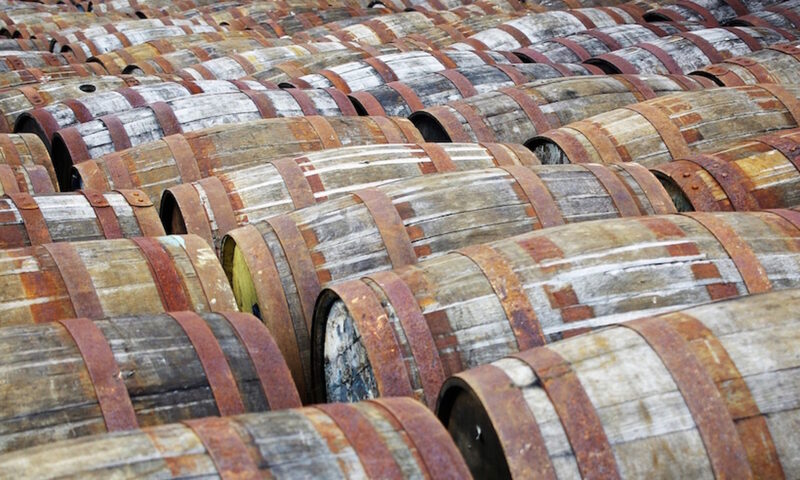 They vat in a ratio of two ex-bourbon casks to one French oak port pipe, all aged for at least 10 years. On the nose it’s soft and sweet with floral notes, cream, light spice, putty, floury green apples, chewy Refreshers and Rhubarb & Custards, and gentle hints of darker fruit and spice – raisin and nutmeg. To taste it starts out light and sweet, with some oak and spice quickly making itself known. It’s got fruity sweet apple (with skins), a touch of nail varnish and developing dark woody notes, with damp bark and sour sappiness slowly appearing. It finishes with a tingle of aniseed balls and tannic wood, leading into some sweet spice and aromatic dry wood. After a while in the glass it showed some more sour spirit notes (tequila?) and a little more alcoholic heat than before, but a drop of water softened things out. My second dram of the train journey was potentially an award winner, although unfortunately as I don’t know which of the many casks they’ve released it was I don’t know for sure. 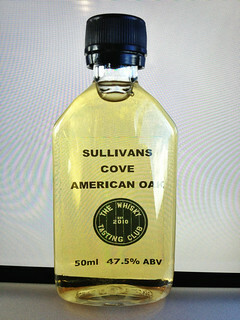 The whisky in question: the World Whisky Awards Best Australian Single Malt – Sullivans Cove American Oak. They reduce their bourbon and port wood single casks to 47.5% before bottling so I can’t even use strength to distinguish between them, but as it’s been picking up accolades since Jim Murray gave it a 95/100 back in 2007 (a rating that while needing salt by the shovel is a useful indicator that the whisky is probably something to have a look at) you shouldn’t be able to go too far wrong. On the nose it had pear drops, ferns, pine, Jelly Tots, gummi fruit, dried pineapple, sour oak, cinnamon, soured vanilla cream and a hint of pot pourri. On the palate it was quite oily in texture with sharp, sour oak, green wood and big spice up front. Behind that a big wall of fruit developed, with more fruity gummi (and white pseudo-mallow – Haribo Fried Eggs? ), custard covered apples, and some bitter and sour spirity notes. It finished with bitter oak and green wood, with aniseed, fruit skins and sweet cream lingering. A splash of water killed much of the sweetness along with the spirity notes, leaving the oakiness as well as a bit of spiced creaminess. While I rather like the Double Cask it’s annoyingly not one that I can see making its way into my whisky cabinet for one specific reason – price. While Australia does have higher excise duty than the UK (~AUS$70 per litre of alcohol rather than ~£30 – approximately 1.5 times more) and is famed in the booze world for being quite expensive for spirits, the whiskies sell for a similar price in both countries – £60 for the Double Cask and £90 for the single casks. That’s a bit much for me, even if it is being shipped about as far around the world as it can go. The distillery also gets points from me for the company slogan – ‘Distilled with conviction’. Billy Abbott I am a big big fan of the Sullivan’s Cove Double Wood. Agree with you on the price issue. If you get the chance check out Bakery Hill’s offerings from Melbourne.